I made another pillow a week or so ago to go with the pillow I blogged about here. To make it, first I found a yard of fabric remnant in a nice salmon-colored linen, and then followed this tutorial from Make It and Love it. The only changes I made were using a marking pen to mark my lines rather than just using pins as a guide and gathering all of the lines a little bit before sewing anything down. I thought I had a nice red quilting cotton to use as my base fabric, but it turned out that I didn't, so I used brown felt. It worked! Go figure. I then used some of the linen fabric for the back, which I made just about the same way Ashley did in her tutorial. I'm really happy with the way this turned out, and as you can see (a little bit) in the picture, it goes nicely with my woven ribbon throw pillow. I'll continue to post more as I make them. **Edited to add that I'll be posting to the parties on the left. And notice how much neater my party list looks? I got the idea from Sweet Little Smoothie! Head on over and join me in begging her to post a tute! I'm sure she would do a much better job explaining it than I would! LOVE it! I"m going to add this to my "to-do" list! Thanks, Katie! I can't wait to see what you do with it! Kelli....I'm not sure why the Linky wasn't working before, but I went ahead and added your link for you! Your throw pillow is jut gorgeous!! That's so cute! 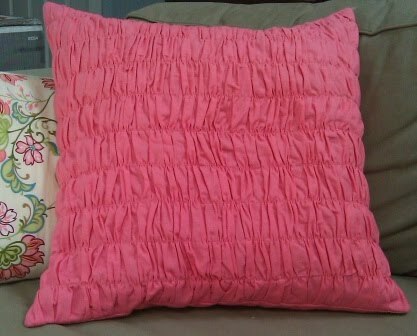 I desperately need to make some cute pillows. I am pillow poor at my house! I'll have to check out that blog for sure! absolutely delightful! so pretty and cheerful! ...and very well done! I'm getting ready to make some pillows for my my new bed linens and I think I'm going to include this little lovely! That is super cute!!! I really like the color of it! Wow, that turned out so cute! Thanks for sharing! This is so pretty! When my sewing machine is fixed, I am totally making one. Very cute and clever! I have to try this. Your pillow is lovely. Hi! I'm visiting from Shabby Nest! Love the gathered pillow. I really wish I could sew! You are very talented. Love the pillow. You are way too talented for me! :) I love this! Hi! I am here from Tatertots and Jello. I love this! What a cool idea! I've got it linked up Kelli! It seemed to work fine, please keep trying next week. Make sure you don't have two of the "html" at the beginning. Let me know if you have any problems! Thanks for planting your creative seeds at Punkin Seed Productions. See you next week! It turned out so well!! I love the color of fabric you chose!!! Beautiful job! Thanks for linking up! What a cute pillow. You did such a great job with it too. I love how it turned out. Thanks for sharing at 'Look at me, I'm SO Crafty!' at Fun to Craft. Please feel free to link to WhimsiKel or use a single image with a brief description and link back. You're welcome to pin on Pinterest.